Note: All other includes natural gas production from coalbed methane, Alaska, and all Lower 48 onshore sources not specified above. The growth in total U.S. dry natural gas production projected in the Annual Energy Outlook 2016 (AEO2016) Reference case results mostly from increased development of shale gas and tight oil plays. Natural gas resources in tight sandstone and carbonate formations (often referred to as tight gas) also contribute to the growth to a lesser extent, while production from other sources of natural gas such as offshore, Alaska, and coalbed methane remains relatively steady or declines. Natural gas production from shale gas and tight oil plays now makes up about half of the U.S. total dry natural gas production. In the AEO2016 Reference case, production from shale gas and tight oil plays is projected to grow from about 14 trillion cubic feet (Tcf) in 2015 to 29 Tcf in 2040, making up 69% of the 2040 total dry natural gas production. This category includes natural gas produced from shale formations as well as from tight oil plays, which are low-permeability sandstones, carbonates, and shale formations. The specific plays included in this category are the Sanish-Three Forks (part of the Bakken), Eagle Ford, Woodford, Austin Chalk, Spraberry, Niobrara, Avalon-Bone Springs, and Monterey formations. Tight gas production is the second main contributor. Although supply from these resources increases by 31% from 5 Tcf in 2015 to 6.6 Tcf in 2040, its share of total dry natural gas production remains relatively constant. Tight gas became a separate wellhead pricing category when the Natural Gas Policy Act of 1978 was passed and established an incentive to produce tight gas resources when natural gas resources were believed to be scarce. When wellhead natural gas prices were deregulated, tight gas lost its specific market-related definition and now refers to natural gas produced from low-permeability sandstone and carbonate reservoirs. U.S. offshore natural gas supply remains at 1.4 Tcf until 2020 in the AEO2016. After 2020, it decreases to 1.2 Tcf, reflecting declines from legacy offshore fields. As production from new discoveries after 2027 offsets the decline in legacy fields, offshore natural gas production increases to 1.7 Tcf in 2040. In the AEO2016 Reference case, natural gas spot prices at the Henry Hub rise to about $5 per million British thermal units (MMBtu) through the mid-2020s from an average of $2.62/MMBtu in 2015, then remain near or below $5/MMBtu (in 2015 dollars) through 2040. In recent years, because of improvements in drilling technology and abundant domestic resources, natural gas production has continued to grow despite relatively low natural gas prices. In the Reference case projection, growth in demand for natural gas in the industrial and electric power sectors and growth in exports of liquefied natural gas place upward pressure on domestic natural gas prices. Drilling technology improvements that are expected to continue through 2040 will help production keep pace with demand (both domestic consumption and exports), resulting in relatively stable natural gas prices throughout the projection period. Other scenarios to be released in the coming weeks include different assumptions about future world oil prices, macroeconomic growth, resource estimates, and technology costs that will affect projected natural gas production and consumption. As a result of growth in production, domestic production is soon expected to surpass domestic consumption of natural gas, and by 2018 the United States becomes a net exporter of natural gas for the first time since the 1950s. 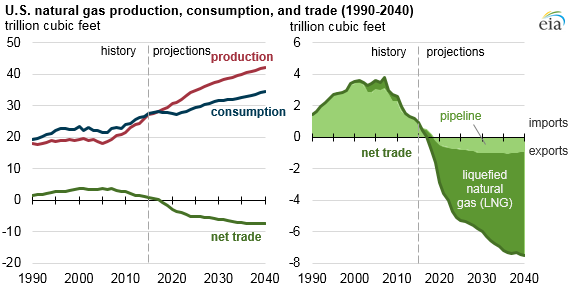 By 2040, net exports of natural gas reach 7.5 Tcf, which is 18% of total U.S. production.